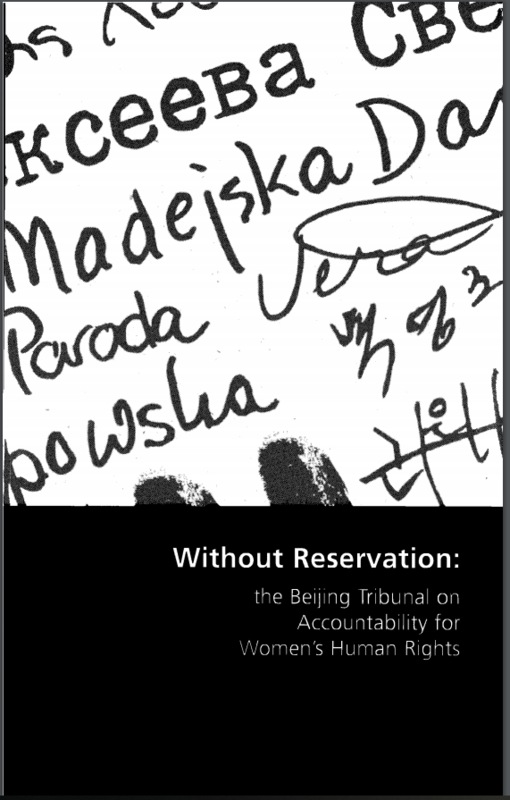 The Global Tribunal on Accountability for Women’s Human Rights at the NGO Forum of the United Nations Fourth World Conference on Women was held in Huairou, China in September of 1995. While also aimed at raising awareness of women’s rights violations and their link to human rights, the organizers sought to shift the focus from visibility of such violence and discrimination against women to strategies for accountability for those crimes. The tribunal marked the culmination of a series of hearings organized by the Center for Women’s Global Leadership (CWGL) and partner organizations entitled “From Vienna to Beijing: Building Human Rights Accountability to Women.” The Tribunal was CWGL’s main contribution to the vibrant women’s movement activities and events held at the NGO Forum in Huairou, 35 miles outside of Beijing, where it had been moved by the Chinese government which was anxious over too much NGO activity in the city. In spite of the distance, the NGO Forum was a massive demonstration of the power and diversity of the expanding global women’s movement and is often seen as the highpoint of global women’s power in the 1990s.